Aahh December... Not only is it Christmas time, but two of my three girls have birthdays in December as well. It is always an absolute crazy time of the year! My poor girls wish that they could "change" their birthdays to be in the summer. 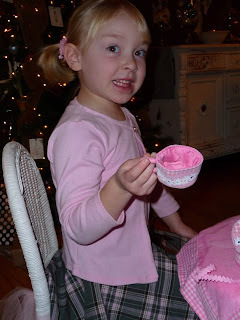 There seems to be more cute birthday party ideas for kids when the weather is nice, but we do our best and using a lot of pink makes it feel a bit more like summertime. 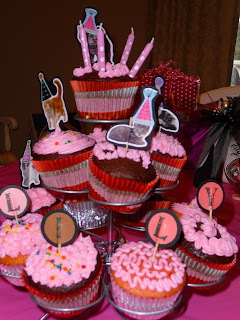 In total, 8 dozen cupcakes were made in less than a week for all the parties. Gabby had her third grade party with cupcakes, then Gabby's family birthday bash at Grandma's house, and another party with her best buds (and more cupcakes). My mom made the adorable house cake for our little family party. She took a cake decorating class about 25 years ago, but she obviously remembered what she'd learned! 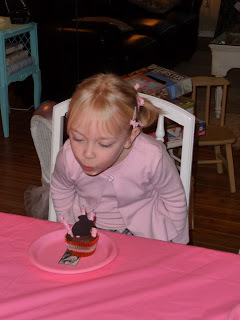 Lily also had a birthday party with pre-school friends and family. 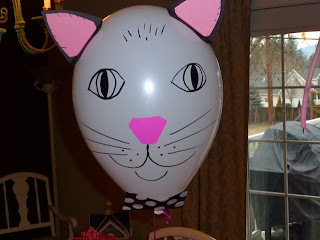 Lily loves kitties and tea parties, so we just combined the two and made kitty balloons and cupcakes and tea party games.